Carole Stubsten of Lake Bonham spent the first part of her life doing things for other people. As a wife and mother, she ran a house and raised three children; as a volunteer, she devoted uncounted hours to others.A few years ago, she decided it was her turn, so she made a list of places to go and things to do and see. Making like Indiana Jones was not on the list. She certainly did not plan to take up archeology. “A dig sort of fell in my lap,” she said. That was in 2006, when a friend, Sally Simpson, a Bonham nurse, asked her to join a volunteer program with the U.S. Forest Service called Passport in Time. “I told her, ‘I do not dig in dirt,’” Stubsten said. Then she reconsidered. “I had all this time on my hands and was looking for new and different things to enhance my life.” So on reconsideration, she said yes, and the other things on her list, a trip to Europe, a couple of cruises and some scuba diving in the tropics, went on hold. That March, Stubsten and Simpson packed up—tent, gloves, small garden tools, eye protectors, hoes, shovels, rakes, a first-aid kit, their food—and packed into the Big Thicket, deep in the Davy Crockett National Forest in East Texas, near Lufkin. Tucked away in Stubsten’s kit was a new green, goldembossed PIT Passport. Each time a PIT volunteer takes part in a dig, the passport is dated, signed and stamped with a silhouette of a moose. 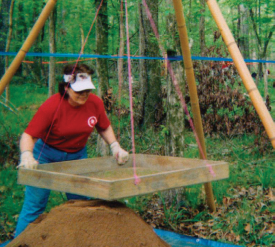 The project was part dig and part repair and restoration of a vandalized Caddo Indian gravesite. Fifty people worked at the site for eight days, camping together and hiking deep into the woods each day to reach the dig. “Gleaning” is a good word to describe the scientific process. It suggests meticulous work, careful searching and attention to detail. Stubsten said her favorite part of a dig is straining the evidence, the process where every shovelful of dug up earth is strained, and any shards of pottery, arrowheads, burned sod, petrified wood, everything and anything found, is separated from the dirt. Every treasured bit is bagged and labeled so it can be cleaned and studied by those working in the on-site lab. But before you can strain it, you’ve got to dig it, and Stubsten turned out to have a bit of that Indiana Jones luck when she took out her tools. She was in a five-foot hole when she unearthed a rock with a thumbprint type of indention in it. It turned out to be a rare find, a genuine and complete two-piece nutting stone; she also found the smaller cracking stone. “A nutting stone was what the Caddo used to crack nuts. Nuts were important to the Caddo; they lived off the land. 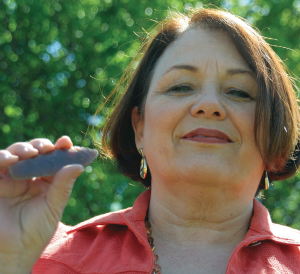 The Louisiana archaeologist carried that nutting stone around with her like it was a new baby,” Stubsten said. The diggers were still buzzing over that rare find when the group found another complete nutting stone in the hole next to Stubsten. They also found many arrowheads, most around five thousand years old, but the real treasure was the nutting stone. “The historians on the dig thought it was around 10,000 years old,” she said. Stubsten “straining” dirt from the dig, looking for evidence of previous civilizations. The Big Thicket dig was just a beginning. Stubsten spent another week with the ancient Caddos in 2007 and unearthed more history. “We even found artifacts not common to the Caddo deep under their encampment site, providing evidence of trading with other tribes,” she said. In a manner of speaking, in 2008, she is digging in her own backyard. Actually, it was more make and mend than dig this time. In late April, she and other PIT volunteers spent a week at Lake Fannin as part of the continuing effort to restore the lake and cabins to they way they were when the camp opened in the mid 1930s. After that, if there are no digs in Texas next year, she said she might go back to her native state of South Dakota for some dirt time. “The real joy of going is meeting fi fty people from all over the United States, from all walks of life. Some are professional people, retired people, students from universities, even a few grandchildren with grandparents. Getting to meet lovely people is just wonderful,” she said. Perhaps it is a regression to childhood, but Carole Stubsten now will tell you that she enjoys digging in the dirt, and she is witness to the idea that one culture’s trash is another culture’s archeological treasure. You just have to dig it up.